How did development actually happen in Forest Hill? Did the city’s leaders heed the advice of international experts to establish good governance as a first step of development, namely, by furnishing secure property rights to private entrepreneurs and resolutely eradicating corruption? Or did it model itself after the developmental states of East Asia, by establishing technocratic state agencies and channeling resources toward targeted industries? Alternatively, did the city make do with “good enough governance,” delivering only minimal government performance and waiting until it had become sufficiently wealthy before improving governance? The answer to all three hypotheticals is no. Ang’s own theory of China is a variant on the “regionally decentralized authoritarianism” or Chinese-style federalism argument, which puts the emphasis on the striving of local officials to generate growth. In particular, her book has some good detail on the systems for motivating and evaluating local government officials. But she also, correctly in my view, emphasizes how the pressure on local officials to generate growth ends up having very different outcomes depending on the characteristics of different localities. The core of the book is a set of detailed narratives of a few different localities in China. These emphasize that government officials did not follow a consistent strategy, or gradually perfect institutions, but instead continuously adapted in response to changes in the economy. Rather than a one-way causation from institutions to economic outcomes, or vice versa, there is a constant feedback between the two. These accounts are well done and pretty convincing for the take-off period of the 1980s and 1990s. The Why Nations Fail crowd has never really managed to provide a decent account of Chinese economic development (which is a bit like having a theory of linguistics that fails to explain the grammar of English), and accounts like this that tackle the detail of China’s actual institutions are good to have as a corrective. Still, Ang’s narratives get a bit less detailed and convincing as they move into the 2000s. 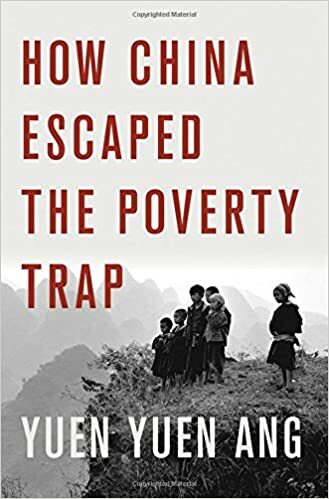 For a book about economic development there is sometimes a vagueness about what has actually happened in China’s economy over the past decade and a half. The impact of the rise of township-and-village enterprises in the 1980s and the privatization of state-owned enterprises in the 1990s are well covered. Yet there is almost no discussion of the growth in foreign investment and exports that followed China’s entry into the World Trade Organization in 2001, or of the enormous real-estate boom that got started around 2003 and is still running, or of the global financial crisis of 2008 and the subsequent surge in infrastructure spending. The focus of the book is, as the title indicates, on the early stages of China’s growth boom, so these are not crippling omissions. But digging into these developments more would help answer the broader question of whether the feedback between economic change and bureaucratic decision-making in China has always been as positive as it was in the early stages of its growth take-off.